I have a nice Peppermint Recipes roundup to share with all of you! 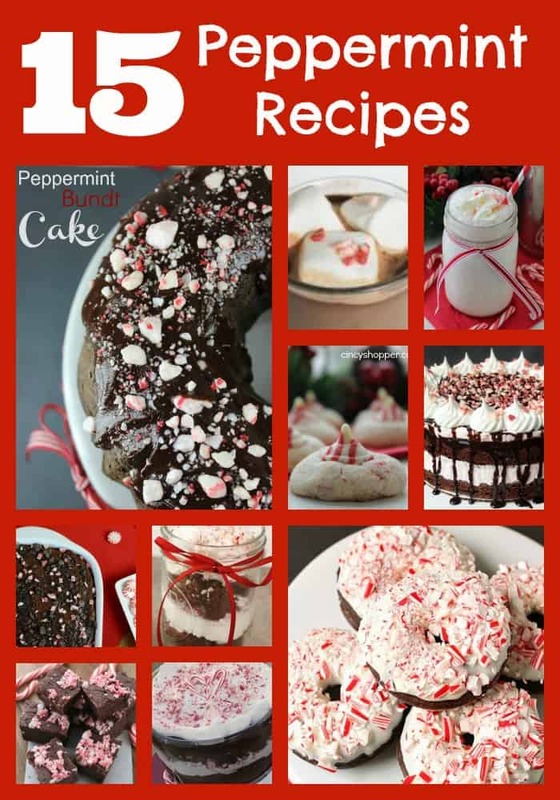 If you are a fan of peppermint you are going to enjoy this list of peppermint recipes. This one include cakes, drinks, cookies and treats. I have tossed in some of my own peppermint recipes in this list if you have missed them. Be sure to let me know if you decide to make any of these. I know I am planning to make a few of them myself. Peppermint Bark Donuts– Oh My! Donuts and Peppermint! Peppermint Hot Chocolate– One of my all time favorites. Peppermint Milkshake– This is yummy, I know because I made it ha ha! Christmas White Chocolate Peppermint Popcorn– The family would love this one! Peppermint Cheesecake Brownie Bites Jar– Goodness, brownies and cheesecake. Peppermint Bundt Cake– I shared this one with you- Quick & Easy with Chocolate goodness! Peppermint Mocha Brownies– These ones are quick and easy. I think I need to whip these up this week. Chocolate Peppermint Trifle– Oh my! some more peppermint tastiness. Mini Peppermint Cheesecake– This one is made with a cookie crust and personal sized yumminess! Peppermint Mocha Poke Cake– Oh I love Mocha, I love Peppermint and I LOVE Poke Cake. This looks so tasty! Peppermint Kiss Cookies– I made these to share with you, I know they are tasty! Peppermint Cookies and Cream No Churn Ice Cream– If you adore Ice Cream and Peppermint this one is for you! Peppermint Brownie Ice Cream Cake– This is absolutely amazing, I am thinking I MUST make this one. 2 Minute Peppermint Fudge- Another one of my creations, so creamy and super quick! Thanks so much for including me in this collection!